Despite the efforts of the military to rid the Federally Administered Tribal Areas (FATA) within Pakistan of insurgent groups, some still survive and flourish. It is for this reason that US President Donald Trump attacked the Pakistani government on New Year’s Day 2018 with the following tweet, his first of the year, “the United States has foolishly given Pakistan more than 33 billion dollars in aid over the last 15 years, and nothing but lies and deceit, thinking of our leaders as fools. They give safe haven to the terrorists we hunt in Afghanistan, with little help. No more.” The US has long sought tougher action against the Taliban and Haqqani network and has now suspended around $2 billion in aid as a response to Trump’s claims. The criticism from Trump has not gone down well with the government and armed forces who launched operation Zarb-e-Azb (sharp strike, referring to a sword of the Prophet Muhammad PBUH) on 15 June 2014 in North Waziristan against militants along the Afghanistan/Pakistan border. This followed an attack on Jinnah International airport on the 8th June 2014. “Zarb-e-Azb was launched against terrorists of all hues and colour, with sanctuaries of terrorists dismantled during the operation without discrimination,” These are the words of the Chief of Army Staff (COAS), General Raheel Sharif on two year successful completion of the operation Zarb-e-Azb, and, today, Pakistan is a safer place than it was before the launch of Operation Zarb-e-Azb in 2014. However the clearing of “sanctuaries” is often disputed and despite displacing the civilian population of North Waziristan to carry out Zarb-e-Azb it was deemed necessary to follow this with Operation Radd-ul-Fasaad (Elimination of strife) in February 2017. Now a new video has been released by a “thorn in the side” of the Pakistan government and military, Senior Tehreek-e-Taliban (TTP) commander Adnan Rasheed who was linked to an assassination attempt on President Pervez Musharraf in 2003 for which he was awarded the death sentence in 2005. Rasheed was sprung from his death cell in Bannu Central Jail, in Southern Khyber Pakhtunkhwa on 15th April 2012 along with nearly 400 other prisoners. The attack was carried out by 200 heavily armed TTP militants assisted by Uzbek mujahideen with the attack filmed as it happened. After release, Rasheed went on to head up a Taliban unit Ansar Al-Aseer tasked with freeing prisoners and was later linked to the Dera Ismail Khan jailbreak on 30th July 2014 where 175 prisoners were freed including 35 high-profile militants. He was also alleged by some media to be the mastermind behind the Karachi airport attack. Rasheed, an ethic Pastun, is also known internationally for his letter to teenage education activist Malala Yousafzai (from the same tribal group) who was shot in the head by TTP operatives alleging in a statement she had maligned Islam and Shariah. Rasheed who was in prison at the time of the attack expressed his shock at the incident which raised international condemnation and stated that he wished it hadn’t happened. He encouraged Malala to return to Pakistan to study under the Islamic system of education. Looking back at the history of the militant once labelled Pakistan’s most wanted man, Rasheed claimed to have been “turned” by senior offices whilst working as a Junior Technician in the Pakistan Air Force. Writing on his road to jihad in Azan, he alleged he joined a clandestine group within PAF under the name Idara Tul Pakistan (Institution of Pakistan) set up to recruit jihadis from the Army, Navy and Air Force. 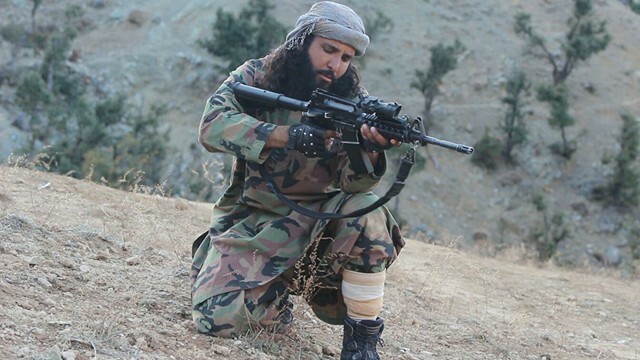 Amongst other allegations are that his superior granted him four months training leave to participate in a Jaish training camp in Mansehra district, Khyber Pakhtunkhwa. It comes as no surprise then that America often claims Pakistan is playing “a double game”. On 3rd January, CNN quoted the US Ambassador to the United Nations Nikki Haley as saying, “they work with us at times, and they also harbour the terrorists that attack our troops in Afghanistan… that game is not acceptable to this administration.” In turn many in Afghanistan and Pakistan say it is the US and allies that are the “terrorists”, occupying Afghanistan, inciting more violence through endless war and bombing and droning the civilian population. Rasheed expresses an allegiance to TTP who helped rescue him from prison however was not linked to the shocking attack on Army Public School massacre in Peshawar in 2014 and has expressed his concern regarding civilian casualties during some operations. It appears there are multiple groups working under the umbrella of TTP some of which may operate independently of the main body. 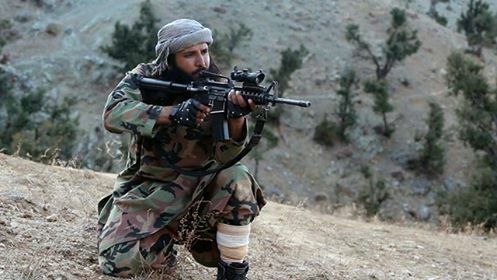 In the latest video from Umar Media which was swiftly removed from social media, Tehreek-e-Taliban Pakistan’s (TTP) special forces are seen in training and working with new recruits which includes karate and target practice. Rasheed takes an oath of allegiance for TTP Ameer Molana Fazlullah from the newly trained sniper shooters.